This wasn’t the medal that team Canada wanted to play for, but this is the game they ended their tournament with. Despite strong play through their preliminary round, the loss to Russia Tuesday night was the most significant game of the tournament. For Finland, losing is never easy, but losing to Canada in Canada only increased the focus on their loss. Not that a 4-0 loss wouldn’t draw enough attention as it was. Team Canada didn’t open up the scoring until midway through the first period with a power play tip in goal by Tanner Pearson on a shot from the hash marks from Winnipeg Jets prospect Mark Sceifele. The crowd which was definitely at less than capacity roared. Scoring didn’t happen again until the second period when Quinton Howden took a pass from Mark Scheifele behind the net and absolutely sniped one past Finnish goaltender Sami Aittokallio. For Finland, their best scoring chance may have been their penalty shot of the second period, but Canada’s netminder Mark Visentin stood strong and easy tossed the shot aside. Canada would see a fourth and final goal from Howden with 2:25 left in the game, securing without a doubt the bronze medal for Canada. Howden scored his second of the game as Freddie Hamilton blocked the goaltender leaving a wide open net for Florida Panthers’ draft pick Howden. The Finnish defence stood no chance on the goal. For Edmonton Oil King and Buffalo Sabre prospect defenceman Mark Pysyk this tournament was a long time coming. Cut from the team last year, Pysyk a native of Edmonton had the chance this year to play for his country in his home town. Pysyk, as with all members of team Canada had dreamed of playing their final game for the gold medal, but were satisfied to walk away with medals when so many other players didn’t. 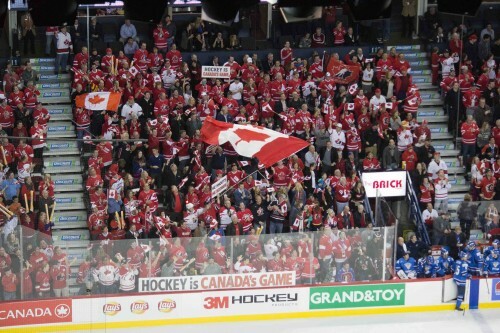 Canada also played a physical game that they did not play against the Russians. Canada had played Finland last week and knew that they could win, and it may have been the confidence that in some ways made this game somewhat less intimidating and brought out the best in the team. Team Canada head Coach Don Hay had nothing but a glowing review for goaltender Mark Visentin calling the netminder “outstanding” and someone who made big saves in each period. Visentin may also have made the save of the tournament while earning his shutout. Thinking that the puck was already behind him, when it in fact had bounced off of the back of his pants, Visentin spun around and caught the puck behind his back. The Phoenix Coyotes who drafted Visentin in the first round of the 2010 NHL entry draft may want to keep that video on file for fans to appreciate. “There was a very empty feeling yesterday, knowing that you didn’t have the chance to win and I’m sure Finland was going through the same thing.” Explained Hay, reminding everyone that these are competitive athletes for whom losing will have a lasting effect. Not too long though, one would hope. The players should not leave this tournament with feelings of regret. The level of competition is high at this tournament; these are the best players of each country, and seemingly anything can happen or change from year to year. There is only one game remaining, the gold medal. For the Calgary crowd, Sweden will be the home team. If Sweden wins the gold, it will be their first since 1981, while the Russians took gold last year. And it’s the Swedes in OT over the Russians, 1-nil.